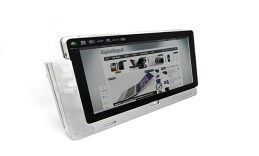 Acer Iconia W700 is one of the most powerful and fast-performing tablets we have seen so far. es, tablets more or less hold the general idea about what the future computer gadgets will look like. Even the platforms are already engineered to suit their flexibility and mobility meaning Windows 8. Tablets are on their way to replace laptops in power as well. In this video review you will meet one great laptop contender this is Acer Iconia W700. Although the design holds some really interesting ideas, we will start with the hardware specifications because we definitely have a lot to say here.The engine that runs this machine can be up to a dual-core IntelCore i5 at 1.7GHz with 3MB cache. It overclocks up to 2.6GHz. The system memory on board is 4GB DDR3 SD RAM which is a great addition that delivers excellent performance under the Windows 8 platform. And if you so far already thought that it’s a rather powerful tablet, which stands close to ultrabooks we will only add, you are so very right. The big surprise was the 128 GB Solid State Drive that perfectly wraps up the hardware unit of this high-end performing tablet. The 11.6 inch display was also something we can possibly praise Acer for. The IPS Cine Crystal panel works in Full HD resolution. The Active Matrix LCD screen has pretty strong brightness and its performance excels with accurate colors and great contrast. The hardware unit responsible for the visual work of the W700 is HD 4000 with 128MB capacity. The sound doesn’t fall behind the great visuals, the HD audio is delivered to you by Dolby Home theater 4 technology. The battery productivity was a pretty good one. The 4850mAh 3-cell battery places the machine on one of the top places among other tablets talking battery life. Playing hard with the device, surfing on Wifi and watching videos the battery holds for around 8 hours. 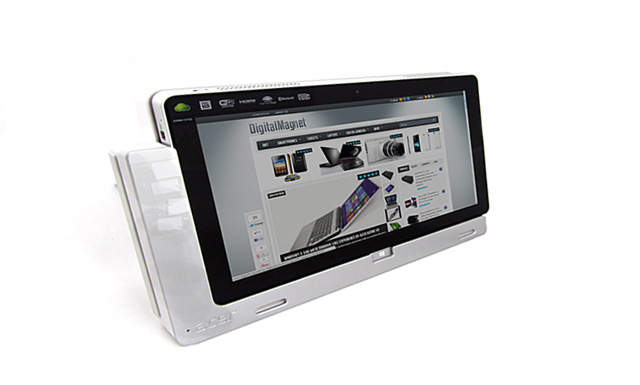 The tablet slides into the plastic docking frame via USB 3 and an AC power plug. The docking station delivers 3 more USB 3 ports at your disposal. At fist we felt a bit awkward using the docking station as it connects to the tablet quite unusually.As this tablet is powerful enough to compete with many laptops, it features s wireless ultra portable Bluetooth keyboard. It is island style and surprisingly comfortable even for fast typing. The docking stand holds the tablet in the most comfortable position and together with the keyboard turns it into a great desktop set. The tablet connects through HDMI port, one USB 2 port and a second one USB 3 port.